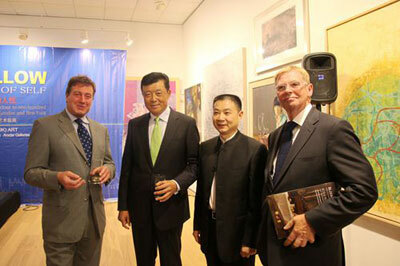 On 2 September 2013, the grand opening ceremony of the Chinese Contemporary Art Exhibition Blue & Yellow, organized by YOURUN International Art (UK), was held at the Mall Galleries. Nearly 200 people, including the Chinese Ambassador to the UK H.E. Liu Xiaoming, British politicians, businessmen, scholars and people of cultural and educational circles attended the ceremony. In his speech, H.E. Liu Xiaoming warmly congratulated the organisers and sponsors on the opening of the event and spoke highly of the artistic attainment of the exhibition works. Ambassador Liu pointed out that this exhibition was unique and rewarding in three aspects: the theme and content, high level of contemporary Chinese art and combination model. Young artists have graphically recorded the swift transition of their own lives. They are from a generation of Chinese that has experienced immense changes. It means that the exhibits are expressions of their thoughts and observations about a society changing at unprecedented speeds. What makes the young talented artists different is that they have drawn on the best of Western art while carrying on fine Chinese traditions. This exhibition reveals a fusion of Western and Eastern artistic inspiration, as well as a combination of ancient times and modernity. In addition to the wonderful exhibition, there will be lectures and auctions. So this is a three-in-one event encompassing culture, academics and business back to back. Ambassador Liu stressed that this is a highly active summer for China-UK cultural exchanges. It was full of highlights: We watched the ballet production of Jane Eyre by Shanghai Ballet Company in London. Beijing People’s Art Theatre staged The Tragedy of Coriolanus at the Edinburgh International Festival. Now we are here opening this exhibition of contemporary Chinese art. This exhibition joins a growing stream of artistic exchanges between our two countries. More importantly, each of these cultural events is laying the foundations for building many bridges of understanding and bonds of friendship between the Chinese and British people. 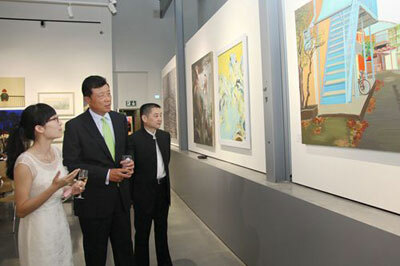 Over 100 excellent pieces of works by 100 Chinese young and middle-aged teachers and students from top contemporary Chinese art academies were exhibited this time, which was rare in similar events in recent years. The exhibition paintings were well grounded in creation and unique in style, giving a vivid description of every aspect of the contemporary progression of China and truly reflecting the development of contemporary art paintings of China. The exhibition was co-organized by YOURUN International Art (UK), the Mall Galleries and Dreweatts & Bloomsbury Auctions and received strong support from the Chinese Embassy in the UK, Provincial Party Committee of Jiangsu and the Jiangsu Provincial Department of Culture. Organizers held a preview in London this June and dozens of plenary lectures on art appreciation of Chinese contemporary art. After the exhibition was opened officially, an auction will be held in London on 7 September.